Clip, clop, clip clop. . ..horses slowly pull our carriage away from the ferry dock at historic Mackinac Island (pronounced Mack-in-awe) between the upper and northern peninsulas of Michigan. 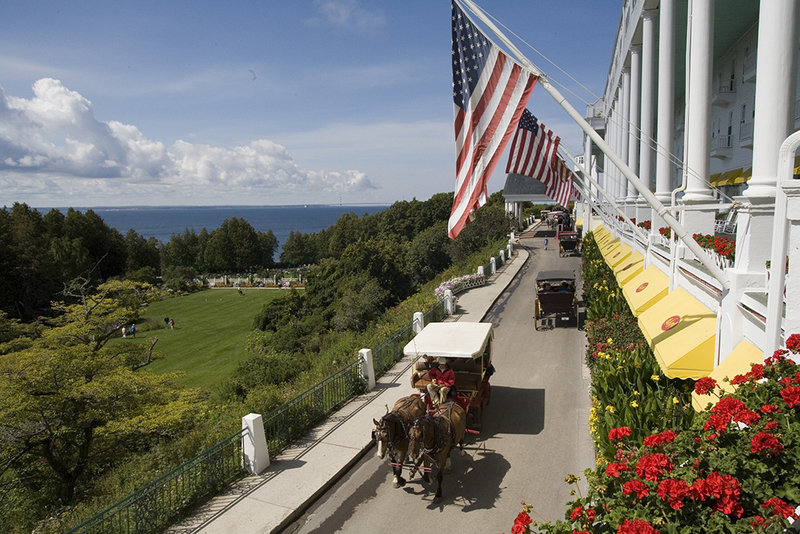 They climb lazily up the hill toward Grand Hotel perched high above the village overlooking the Straits of Mackinac. 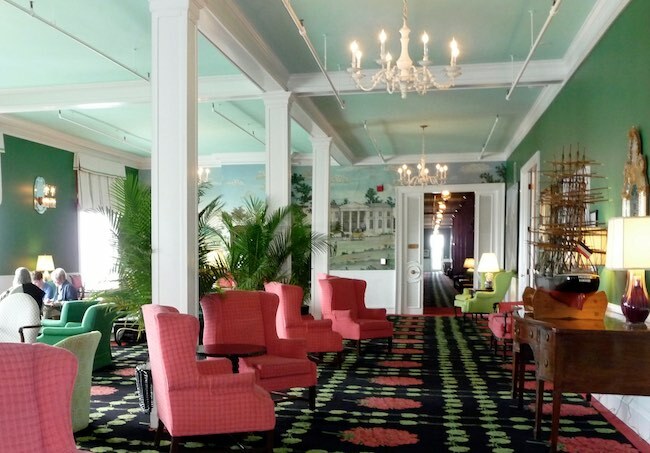 It’s opening day in May for this legendary hotel that closes during winter. In 1904, there were 1200 wood framed hotels; today only a handful of these iconic Victorian beauties remain. 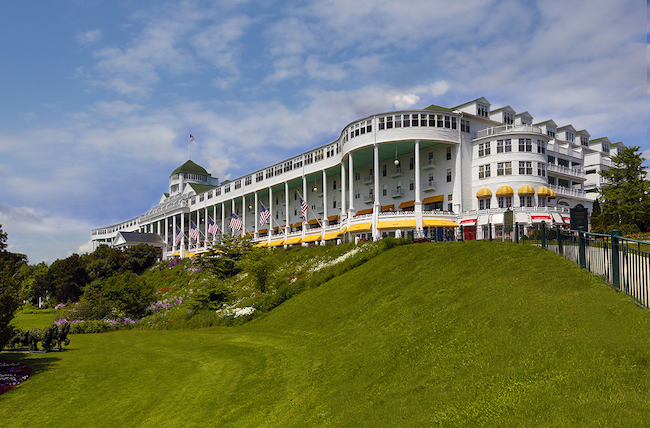 The magnificent family-owned Grand Hotel with its legendary 660-foot colonial porch—the longest in the world—is one. It opened in 1887, built by railroad companies as a retreat for the wealthy “at a time when it was socially acceptable to show off money, jewelry, clothing and architecture,” said Bob Tagatz, the hotel’s affable concierge and historian. “People during the Industrial Revolution wanted an escape to fantasy and to get out of the dirty, smelly cities. Here, there are only two things you smell—one of them is fudge,” he said with a grin. 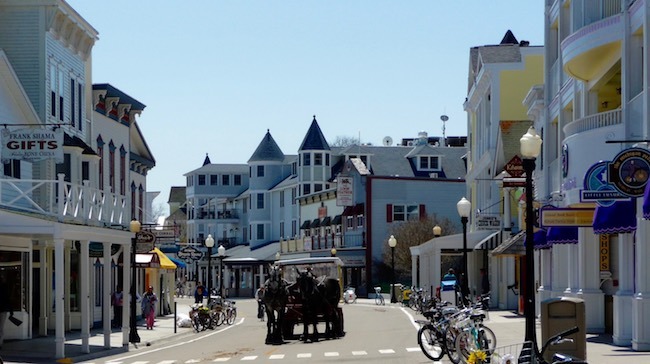 Tagatz is referring, of course, to the island’s dozen or so famous fudge shops and to the only mode of transportation besides bicycles allowed—horse-drawn carriages. But “pooper scoopers” do a great job of keeping the streets clean and free from horsey smells, and the absence of cars creates a quaint 19th century ambiance as well as a fresh, noise-free atmosphere. As it has been during its 130-year history, the award-winning Grand Hotel is a summer-only retreat open from early May until end of October. The exquisite décor of the entire hotel reflects the summery, carefree mood of the season. New York designer Carleton Varney made wide use of his trademark vibrant colors, floral patterns and bold contrasts. The result is stunning over-the-top elegance. 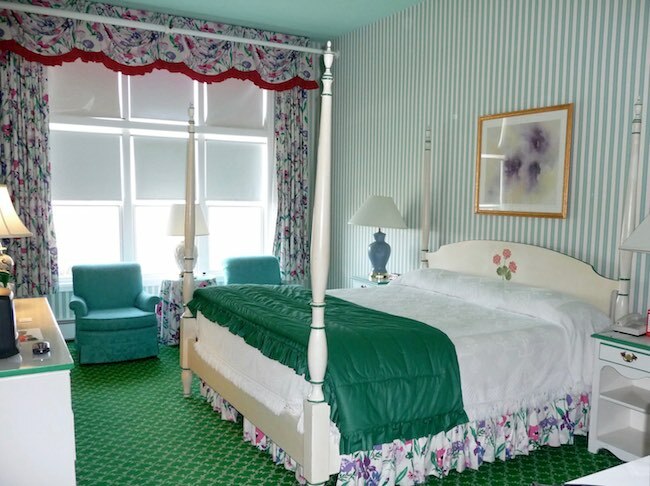 Of the 393 guest rooms, no two rooms are alike! About 40 of them are designated “Named Rooms,” honoring a specific time period or historic person or event. Seven U.S. First Ladies helped design rooms that contain their official White House portrait, a brass doorplate with their signatures, autographed books, and décor representing their personal taste. 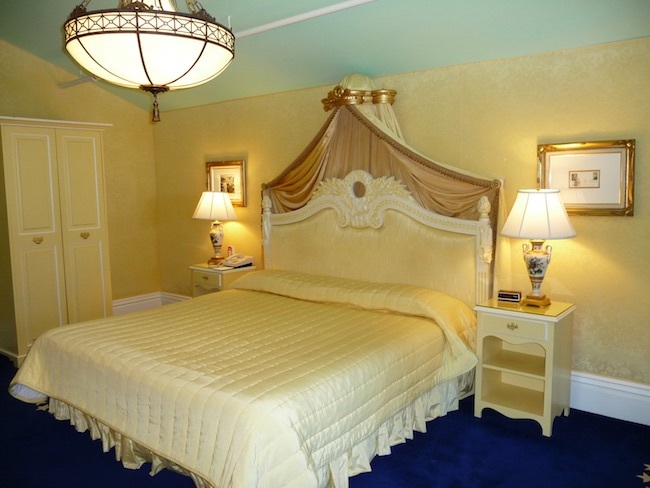 I loved seeing how Varney decorated each room so differently, so lovely, so romantic! 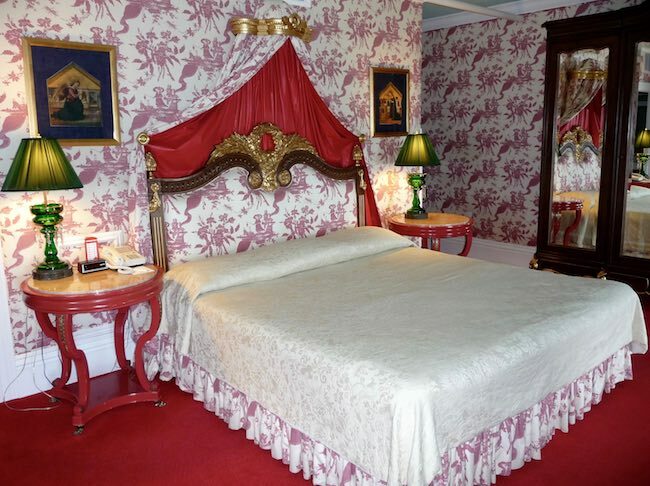 One suite commemorates the romantic movie Somewhere In Time with Christopher Reeve, Jane Seymour and Christopher Plummer filmed at the Grand Hotel in 1980. The hotel hosts a Somewhere in Time weekend every year in October when guests come in period costumes ready to party like it was 1912. All rooms are air-conditioned and include a minibar, safe, TV, WiFi, iron/ironing board, hairdryer, coffeemaker and a copy of New York Times Digest every morning. There’s a 19.5 percent hotel charge on all rates plus local and state taxes. The round-trip carriage ride from the ferry dock to the hotel costs $8.50 per person. The good news is that the hotel does not permit tipping (except in the spa/salon and off-site restaurants). A certain gentility permeates throughout the hotel, in keeping with Old World traditions that never left. One of these is dressing for dinner in the Main Dining Room. Men are expected to wear coats and ties; women should be in dresses or nice pants. This created an unexpected dilemma for my companion who forgot to pack his sport coat. No worries. . .he went to the men’s clothing store Cagney’s, one of 12 retail shops in the hotel, and bought a nifty blue blazer. Now appropriately dressed, after dinner we joined others in the Terrace Room where every night the orchestra begins to play at 9:30 for dancing. For 30 years, Chef Hans Burtscher has headed up the award-winning dining program. 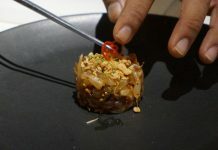 The hotel offers several options for dining at any of its 14 eateries. 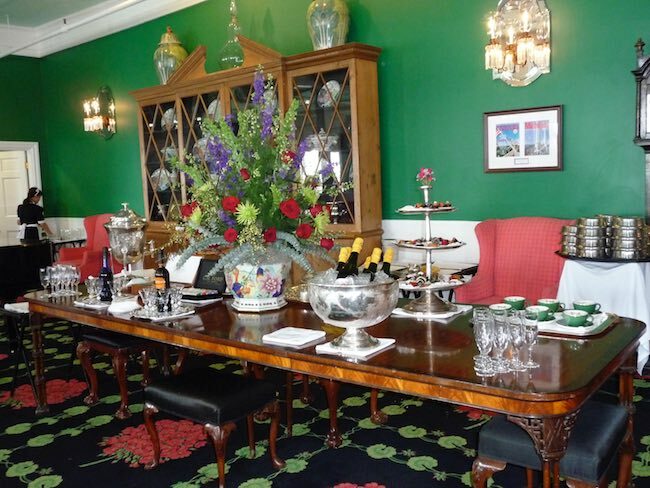 Most room rates include a huge breakfast buffet and a five-course dinner daily in the lovely Main Dining Room. You can also go to one of the more casual offsite restaurants owned by the hotel and get a $20 credit toward your bill. The famous Grand Luncheon Buffet is offered in the dining room with the full American plan. You can order a picnic lunch to take with you for biking, hiking or sightseeing tours on the island. 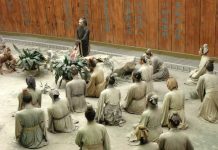 The different plans and packages are outlined on the website. When was the last time you played croquet? Yeah, me too. It was so much fun reviving this genteel game on the expansive lawn on the hotel grounds. Equipment to play croquet and bocce ball is free to guests. 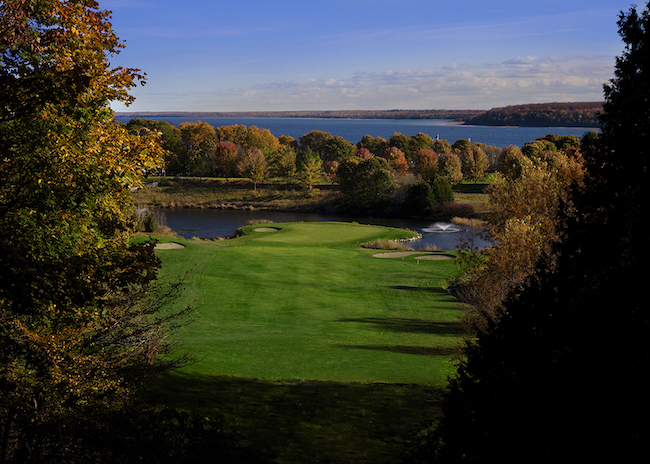 Golf, tennis, pickle ball, swimming, horseback riding and a fitness center are other ways to get physical at the Grand. Children 5 and older have special activity programs that are at no extra cost. For relaxation, there’s a spa and salon, beautiful gardens to stroll, horse and carriage tours, and afternoon tea served daily in the Parlor ($40 plus tax per person). My favorite activity was a bike ride around the island with a picnic lunch, a fun half-day excursion with several stops along the way to check out natural and man-made history landmarks. On the shore of Lake Huron, we went into the old Mackinaw Point Lighthouse built in 1892 and engaged in interactive exhibits. Then we climbed the tower for a breathtaking view of the Straits of Mackinaw. On the shore bike path we rode past charming Victorian homes of the island’s 600 permanent residents and through the village. Here, five historic buildings—open from mid-June to late August—showcase life as it was in the 1820s and 30s when Mackinac Island was the center of the Upper Great Lake Fur Trading. Mission Church is Michigan’s oldest church building. 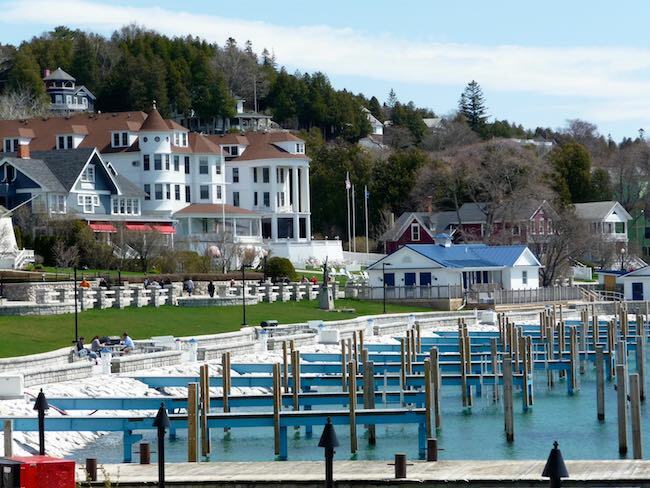 Because of these significant structures and other historic places, Mackinac Island is designated as a National Historic Landmark. 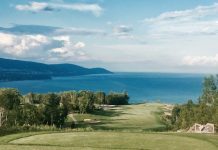 One tour we took was a carriage taxi to Fort Mackinac, a walled bastion high above the water founded by the British in 1780 during the American Revolution. With 14 restored original buildings, exhibits, and reenactments that include an earth rattling cannon firing on the hour, it’s a wonderful history lesson for adults and kids. 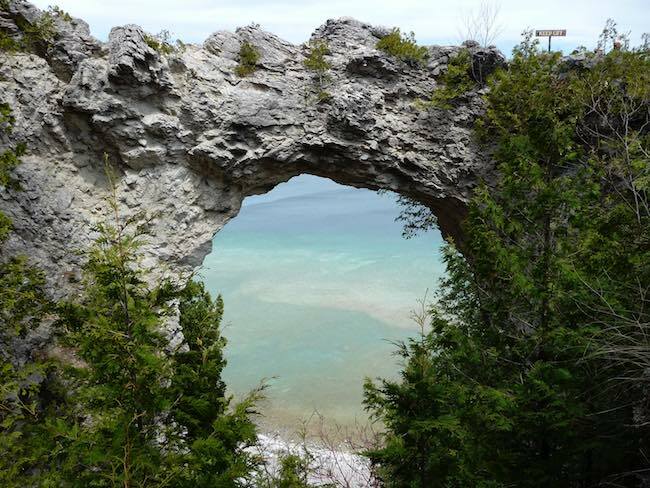 Find other historic sites, museums and activities on www.mackinacisland.org. Wonderful shops, hotels, a few bars and restaurants, and those ubiquitous fudge shops make up the rest of the downtown area. On my bucket list is a visit to the island during winter for cross-country skiing. Imagine what a dreamy Victorian sight the snow-covered village would be! Though small planes are the only form of travel during winter, my colleague in Northern Michigan talks about his snowmobiling trip across the frozen water. . .what an adventure that would be!